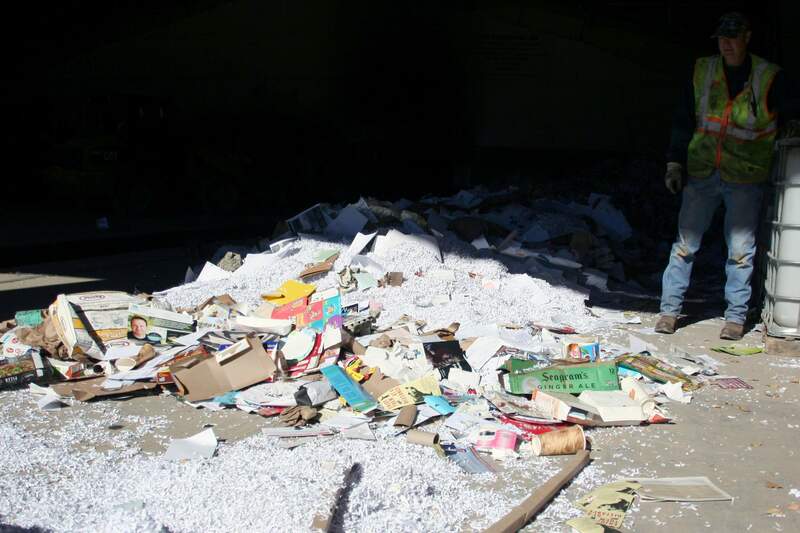 Discarded paper and newsprint are collected at the Montezuma County Landfill. Landfill Manager Shak Powers said the landfill accepts newsprint, but that if office paper and newsprint are mixed, they lose value. The city of Cortez and Four Corners Recycling Initiative both stopped recycling newspaper in the past year. Discarded paper and newsprint are collected at the Montezuma County Landfill on Tuesday. Mel Jarmon, Montezuma County Landfill foreman, looks over a pile of recyclable paper on Tuesday. 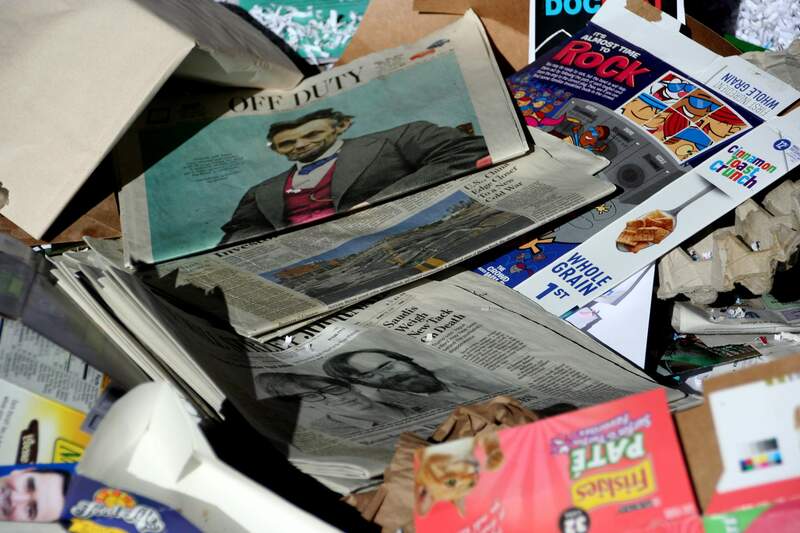 In the past year, both the city of Cortez and Four Corners Recycling Initiative have stopped accepting recyclable newspaper in a time of shifting markets and lowered prices for recyclable commodities. Isolation, low population density, lack of storage space and a recent policy shift in China have combined to challenge local recycling systems, and bring lower prices across the recycling spectrum. The city of Durango instituted a $2.69 per-month surcharge as part of city utility bills earlier this year as a result of the changes in the global market. But it does not expect to make any changes to its billing structure or the type of material it will accept in the near future, said Levi Lloyd, director of city operations. Durango is insulated from the changes other municipalities in the region are making because Albuquerque-based Friedman Recycling is continuing to accept the city’s single-stream recycling, mixed bales of aluminum, plastic, paper and other materials, he said. Friedman Recycling separates the bales and sells the materials to other markets. The price of recyclables was hurt globally when China, a major importer of recyclables, started enforcing bans last year and this year on many types of materials because they were so badly contaminated with trash. “They basically said, ‘We’re not taking this anymore. It’s too contaminated. It doesn’t look like recycling. It looks like waste at this point,’” said Wolf Kray, environmental protection specialist with the Colorado Department of Public Health and Environment. The most populous country in the world banned mixed paper, mixed plastic and about two dozen other commodities from the United States and Europe, Kray said. In the U.S., commodities like cardboard, plastic bottles and tin cans are typically collected from homes and businesses, sorted, baled and shipped to buyers that remanufacture those commodities into new products, like plastic fencing or carpet. Kray said the U.S. was heavily reliant on China for end-market recycling and the import ban has had a pretty dramatic impact on the market value of recyclable commodities. Kray added that he didn’t know of any other town that has stopped taking newsprint. 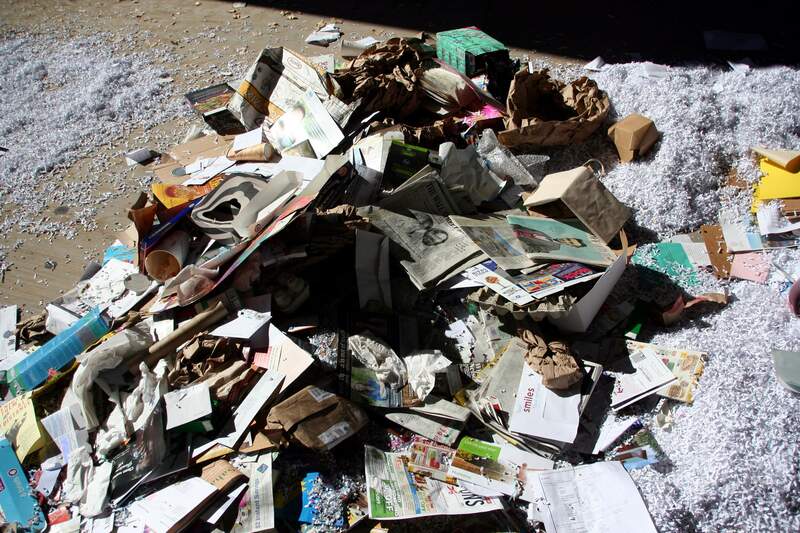 City of Cortez Recycling Coordinator Colby Earley said the decision to drop newspaper recycling was based in part on a lack of storage space as well as a declining market. He said there is a strong market to sell bales of office paper, but it is not cost-effective to pick up newspapers, because it has “so many” pickup stops. “It’s better just to go with something that’s more of a sure shot,” he said. The city has residential trucks with compartments for plastic, paper, metal and cardboard. One truck collects cardboard from 110 commercial clients, and another collects office paper, but the city has no efficient way to collect newsprint, he said. The Four Corners Recycling Initiative, a nonprofit established in 2008, also recently stopped accepting newspaper at its four drop-off locations in Dolores, Mancos and Cortez. The city of Durango does not partner with the Four Corners Recycling Initiative, Lloyd said. He said the nationwide recycling industry operates on a hub model. Big cities like Denver act as hubs, and have access to buyers and remanufacturers, while rural areas like Cortez act as spokes. Each month, hubs produce price indexes that determine how much commodities are worth. China previously purchased mixed paper – computer paper, notebook paper and newsprint – from the U.S., but now wants more specific products. That has caused a glut of materials, with no prospective buyers. As a result, Simpson added, recycling prices have decreased across the spectrum. Newspaper consumers can still drop off their used newspapers at the Montezuma County Landfill. For easy access in Cortez, Daniel’s Concrete and Excavation has placed a newspaper dumpster behind The Journal office, which the concrete company periodically drops off at the county landfill. Landfill Manager Shak Powers said the landfill accepts newsprint, but that if office paper and newsprint are mixed, they lose value. “We do have people that are taking the initiative to just bring it straight to us,” Power said. But as markets adjust, he prefers to train families and businesses to separate recyclables before they’re hauled away. Earley agrees. He said Cortez’s source-separated recycling creates cleaner commodities than a single-stream model, in which residents mix recyclable materials in a bin and they are sorted late, and has produced a preferred status with brokers. “It’s really shut down a lot of the single-stream market, and it’s kind of shown us how vulnerable that market is and for us it’s been vindication of why it’s better to have that labor up front and go with a source-separated system,” Earley said. Separating out aluminum, paper, plastic and other material into product-specific bales at the city of Durango facility would not be impossible but would require a much larger workforce, a redesign of the facility and a much larger facility for storage, Lloyd has said previously. Cortez might have a clean stream, but because of its size and isolation, it cannot benefit from the economies of scale that help big-city recyclers. “Recycling is definitely more of a challenge in smaller, rural communities with lower population densities,” Kray said. Not only are there fewer consumers and buyers, but trucks must travel farther to pick up materials in Cortez. Earley said the area grapples with “dead-head shipping” – instead of carrying a load to and from Cortez, a hauler might come with an empty trailer, leaving local recyclers to pay for the empty miles. A paperless future?Earley said the overall paper mix in Cortez has increased as the city grows, but that individuals, schools and businesses are producing less. “Paper is one of those things that – I won’t say that it will completely die out, but I swear if it wasn’t for junk mail it would seem like you wouldn’t get anything from the residential side,” Early said. Now months into the China import ban, the shape of recycling is shifting. Simpson said that because Four Corners Recycling Initiative relies on rebates from the state, that the nonprofit model might not be sustainable. Coloradoans recycle 12 percent of their waste, well below the national average of 35 percent, according to the State of Recycling in Colorado 2018 report. In August 2017, the state adopted goals to increase the amount of waste diverted from landfills by recycling and composting more over the next 20 years, according to a Colorado Department of Public Health and Environment news release. Residents in Durango recycle about 30 percent of their waste, according to the State of Recycling report. Dirty pizza boxes are one of the most significant sources of contamination in Durango, he said. Many people look at the cardboard and see a recyclable product, but the grease and other food stuck to the box, renders it unusable, he said. Bolstering prices for recyclables will likely require demand from new businesses in the U.S. that can use recyclable products, Lloyd said. Kray noted that several paper mills, including one in Kentucky, have reopened since China’s ban and are manufacturing products out of recycled paper. “It’s good to see more domestic manufacturers using recycling again,” Kray said.